‘Harry Potter’ is just one of those franchises that will never leave us, and for that I am eternally glad. I grew up with the books, and going to see the films with my grandparents at the cinema was my highlight each year. Since then I’ve read the series all over again, and watched all of the films at least three times. They don’t really get old, yet the more recent additions to the franchise are still very much welcome. ‘Fantastic Beasts And Where To Find Them’ is a film based on a textbook featured in the original novels – it’s not actually mentioned all that much, but us diehard fans have been waiting for this moment for a long time. 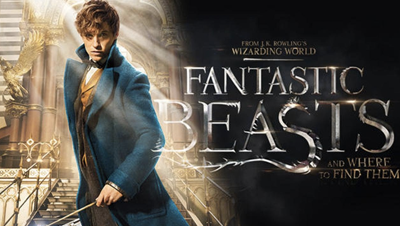 The film focuses on Newt Scamander (Eddie Redmayne), the author of the textbook, who visits New York in 1926, during a time of unacceptance and distrust. Wizard terrorist Grindlewald (Johnny Depp) is on the loose in Europe, creating destruction in the hope that it will force witches and wizards against muggles (or No-Majs, as they are known in America). That’s not why Scamander is visiting though – he, along with his suitcase of magical creatures (including an invisible creature similar to a sloth, and a Niffler that enjoys sparkly things a little too much) is on a quest, yet before he’s even properly arrived he’s taken in by ex-Macusa employee Porpentina Goldstein (Katherine Waterston) after failing to obliterate Jacob Kowalski (Dan Fogler), a muggle who’s seen way too much magic than is necessary. The group, along with Tina’s mind-reading sister Queenie (Alison Sudol) end up having to scour New York for Scamander’s beloved creatures, while something all the more sinister begins to reveal itself. I’ve been super excited about this film for a long time but also rather worried – sometimes a franchise can produce too much, thus becoming a bit of a joke. I was also nervous about what a ‘Harry Potter’ film minus Harry Potter himself would be like. It turns out I didn’t need to worry at all, as ‘Fantastic Beasts’ worked really well. It made sure to reference Hogwarts and Dumbledore and other connections to the original series which helped to keep the fans entertained, yet its distance from the originals meant that newcomers could also enjoy the film without having to worry about the previous eight films they hadn’t got round to watching. This was a good move, and one that I hope opens up the ‘Harry Potter’ series to even more readers and watchers. One thing I did notice was that ‘Fantastic Beasts’ felt a lot darker than previous ‘Harry Potter’ films – the plot was more about discrimination within society than the usual growing up themes we’re so used to, which is a bit more complex for children to take in. However, this was balanced well with the magic and wonder of the curious creatures that Newt tries desperately to reunite with, and the frequent doses of humour that keep the plot from turning too morose. Talking of humour, Dan Fogler was excellent as Kowalski, and if he hadn’t been acting alongside Redmayne he would have completely stolen the show. His expressive face adds to the charm of the movie, and it was hard not to identify with him instantly. Redmayne was excellent as Scamander, perfectly getting across the awkward yet endearing personality of Scamander, whose only goal in life is to stand up for the beautiful creatures that he sees vilified by humans on a day-to-day basis. Even Colin Farrell wasn’t that bad as Graves (another one of my main worries before watching), and Ezra Miller gives yet another strong performance as a dark and disturbed character. Watching ‘Fantastic Beasts’ has only made me more excited for the rest of the series, which means it has certainly done a good job. Perhaps it could have been shorter (full running time is 132 minutes), but with truly excellent CGI and a welcomed vintage feel, it’s another wonderful insight into the ever-expanding world of Harry Potter.